I’ve decided to start up a new series of posts titled “Get the Look for Less.” Inspired by Sabrina Soto of HGTV, I will be doing regular posts about where to get look-alike items that reflect the pricier versions in high end stores. Love the look of Crate and Barrel, Restoration Hardware, Anthropologie and Pottery Barn but can’t afford the high price tag? Never fear, I’ve cut out all the work of finding the same items for cheaper for you! Let’s get started. 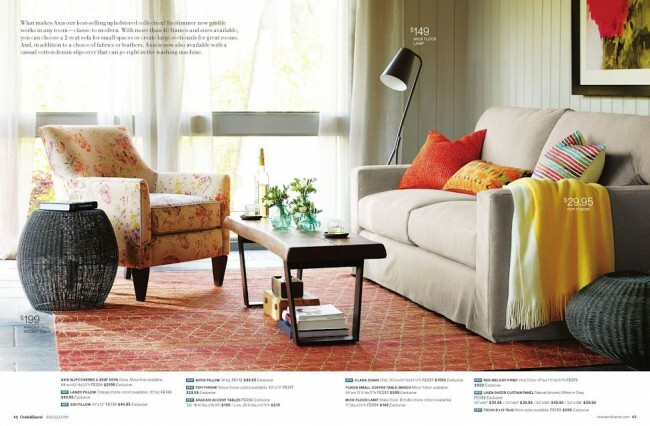 For my first Get the Look for Less feature I found this darling sitting area/living room in a Crate and Barrel catalog. I love the boho chic feel of this petite conversation corner and the variety of colors and textures. But when I went to look at the price tags for each of these items, I was sticker shocked! I’m a smart shopper and like to spend my money wisely, so I decided to use my skills to see if I could create the same look but on budget-friendly scale. 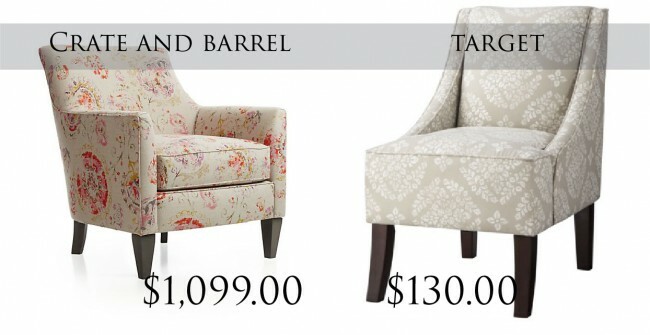 Take a look at my comparisons below to find look-alike items that will give you the same feel but keep those dollars in your pocket! A great neutral couch is great place to start in any living room. The natural beige color provides a great backdrop for any color combo you can think of and can be changed up with the interchanging of a few pillows or throw blanket. The Crate and Barrel couch is beautiful, but far too much, in my opinion, for a small sofa! I found a similar one at Ikea that has the same coloring and similar lines and style for a much better bargain. I love this rustic/industrial slimline coffee table from C&B, but at over half a thousand dollars, I knew I had to find something a bit more wallet-friendly. Enter this beauty from West Elm! At half the price of the C&B table, it keeps the same industrial touch with the iron legs and the natural and rustic charm with the wood slab table top. I’m in love with the light floral pattern and clean lines on this chair from Crate and Barrel and wanted to find a similar pattern for my bargain chair. This one I found from Target has similar beautiful lines and a neutral background. Even though the pattern doesn’t have the same coloring, I am in love with the white floral pattern and that it is neutral enough to fit into any space! And let’s be real, it’s a steal at $130.00! Despite the difference in size of the pictures, both of these lovely rugs are 8×10 which is more than enough to cover a significant portion of any room! 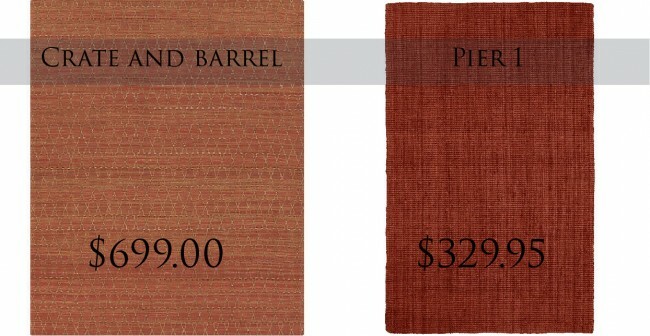 I wanted to go for the same liney texture and rusty/burnt coloring and this area rug from Pier1 more than fit the bill! Bold, beautiful and industrial. Despite the bright colors and otherwise boho feel of this room, I like the unexpected industrial touches both in the lamp and in the table legs of the coffee table. These elements keep the room from feeling too hippie or too cotttage-y and produces a nice edgy blend that is palatable to all. I love the stage light-type shade on the lamp from Crate and Barrel and wanted to find a similar one to keep the drama. I found this one at Ikea for a steal and an added bonus is that the shade is bigger which means more light! In the catalog, I love the unexpected side table that in reality is just a wicker stool. It is untraditional and provides great texture for the eye to feast on, but at $200.00 a pop, I knew I had to look elsewhere. 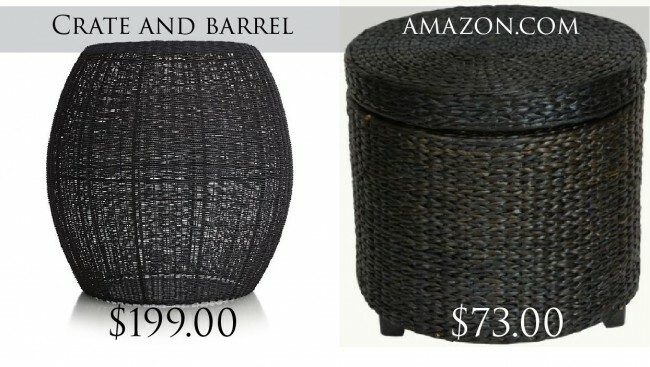 Amazon.com is a great resource for most anything you could ever want and that is where I found this similar-sized, black woven end table. Added bonus that the original doesn’t have: storage! This basket features a removable top and is a great place to store extra blankets to pull out for movie night! As an art major, I love the zing that a really great piece can add to any room. I love the colors, the texture, the way it grabs your eye as you walk in a room. The problem with art, though, is that there is usually a pretty lofty price tag slapped on it. This piece from C&B is no exception. $500.00 for a print?! I know that artists deserve to be paid for their beautiful and pain-staking work (I wish I could earn 500 bucks a pop on any of my pieces!) but as a budget homemaker, it’s sadly not an option. This is where one of my favorite and cost-effective art websites comes in – allposters.com! You can find everything from movie posters to professional-looking art prints on this site. 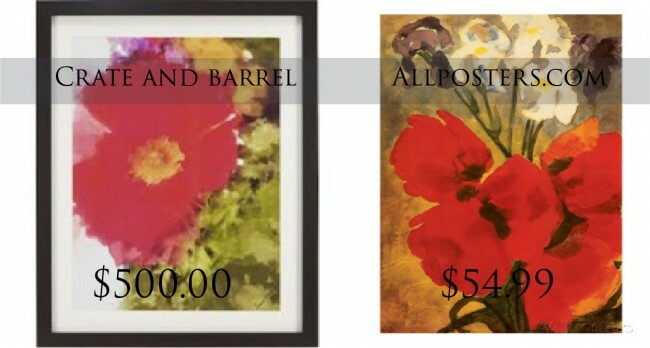 I found a beautiful floral print that rivals the original for a fraction of the cost! Curtains are often a forgotten detail when it comes to design – they aren’t always as exciting as new pillows or artwork! However, curtain panels are really important in tying a room together and providing much needed light filtration and privacy. These two sets of curtains are virtually the same. 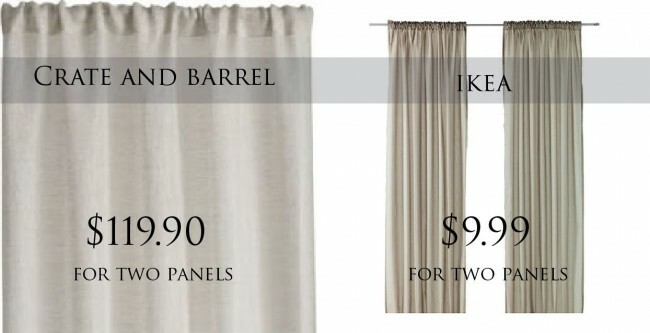 They are sheer, beige/linen type curtains. The huge difference? The price tag! At Crate and Barrel, one panel retails for $59.95, which gets expensive really quickly when you need to cover a lot of window space! Ikea provides a great alternative by giving you two panels for under 10 bucks. What a deal! 3. Cost Plus World Market for $13.99 on sale! The bargain pillows provide the same textures and boho patterns as the originals and bring that desired level of pop to your space! If you bought everything listed at Crate and Barrel your receipt would come to $5,738.70 before tax. Yikes! However, if you bought all of the look-alike versions, your total would come up to (drum roll please…) $1,721.09 before tax! That’s a saving of $4,017.61! Wow! It’s absolutely possible to emulate your favorite stores and styles but not break the bank. 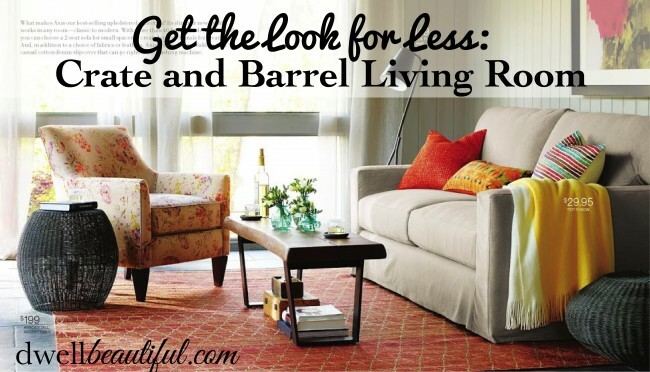 To save even more, try looking for similar pieces at thrift and antique stores or even garage sales! There are lots of hidden gems waiting to be discovered. And even if $1,721 sounds like a lot, it’s still possible to eventually get the same look by buying pieces in installments and not all at once. It may take some time, but it will be worth it in the end. Is it worth it to spend the time to look for knock-off look-alikes? What are some of your favorite stores/brands that you would love to get the look for less?